On the 13th October 2001, two Hong Kong branch committee members accompanied 6 guests to the headquarters of the Hong Kong Marine Department Pollution Control Centre. 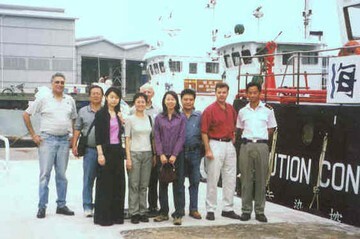 John B. Wilson, a marine surveyor and consultant based in Hong Kong, and Yvette Chan, who was familiar with the operations of the Marine Department through her work with environmental agencies in Hong Kong, and the group of locally based marine surveyors and maritime lawyers, began the afternoon with a trip across Victoria Harbour to the Government dock yard on Stonecutter’s Island. This was onboard ‘MD 58’, one of the Marine Department’s fleet of 10 pollution control vessel’s. During normal operational status, the vessel would carry portable skimming equipment, and holds 22,000 litres of oil dispersant in 3 tanks. On arrival at the Government dockyard, the group were shown some of the other dedicated vessel’s in the pollution control fleet. 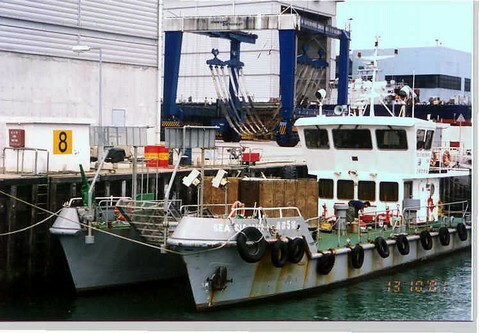 These included the ‘MD 59’, an oil recovery vessel, having 150 Mt oil storage capacity, and fitted with a hydraulic oil powered skimmer, and the ‘MD 51’, which is used for boom deployment, and carries 3,000 litres of dispersant, which is mixed with sea water and deployed by a jet hydrant on top of the wheel house. Closer attention was paid to the ‘MD 38’,a modern aluminium hulled vessel, obtained in 1996, which incorporates a filter belt oil recovery system, and has an onboard tank capacity of 1,500 litres. At the equipment warehouse Marine Department staff demonstrated the operation of one of the portable oil skimmers, and a portable oil dispersant sprayer. The return trip across the harbour was onboard ‘Sea Cleaner 4’. This is one of the 6 Marine Department designed marine refuse recovery vessels. These purpose built 23 m long, twin hulled vessels are highly maneuverable, and fitted with a remotely controlled scoop forward that is lowered into the water. Water nozzles leading ahead of the vessel, gather the floating refuse, which is then lifted by the scoop and emptied into bins installed on a rotating turntable on the main deck. The collection process is controlled from the wheel house, where the contents of the scoop are monitored by video cameras. The twin engined vessels are manned by a crew of 4, and are capable of 12 knots, reducing to 3 knots when recovering refuse. Two vessels operate in the busy Victoria Harbour, with others working in other areas around the territory, taking the refuse to two designated marine refuse collection points. The day was rounded off, by watching a video of an annual oil pollution exercise carried out by the Marine Department, other government agencies and the local oil industry, when both shore and sea clean up operations were practiced.